Layne's signature sauce and lightly breaded chicken fingers are now available at three North Texas locations. It’s not just for Aggies anymore! 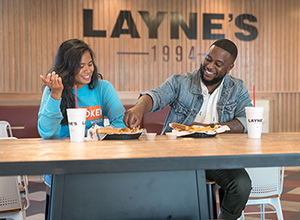 Layne’s Chicken Fingers has expanded northward from their original home in College Station to three locations in the Dallas/Fort Worth area; Allen, Lewisville, and Frisco. Mike Layne first opened Layne’s in 1994 (two years before Raising Cane’s was founded) with eight employees in what was previously a 1200 square foot plumbing supply store in College Station. The menu is limited to just a few items, which allows Layne’s to focus on bringing the best quality possible. Quality is what made them a staple in College Station, and among the Texas A&M family. We’re sure that former Aggie, Dallas-area native, and NFL star linebacker Von Miller will be glad that he won’t have as far to drive in the off season to get his hands on some of these chicken fingers (he’s a big fan). While often compared to the aforementioned “other guys,” they don’t take themselves too seriously. There is a fun factor that you notice immediately upon entry as they bring a quirky sense of humor to seemingly everything they do. From the hours of operation of 10:07a – 9:54p, to the multiple clocks on the wall displaying the time at other Layne’s locations (even though every location is in the same time zone), to their mascot Astro-Chicken, Layne’s keeps it lighthearted and they do what they do best, Chicken Fingers. And when you stop by one of the three new locations, be sure to order some extra Layne’s sauce–everyone’s doing it. (No, really, it’s the most ordered item on the menu.) This 23-ingredient sauce is AMAZING!!! Layne’s lightly breaded chicken fingers have become a recent addiction of ours. Whether you eat them with ketchup or their zesty signature sauce, or with honey mustard every option is definitely a win in our books! Like stated before, the 23-ingredient sauce is AMAZING!!! It goes perfectly with the chicken, fries, and toasts. I personally use it for all 3. On a serious note, it’s pretty cool to see a company grow right before your eyes. Quite inspiring to say the least. 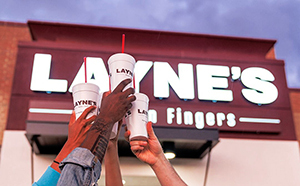 From their humble beginnings in College Station to expanding to 3 DFW locations in one fiscal year, Layne’s is headed in the right direction. 5.) Rumor has it that former TAMU standout Von Miller had his fair share of Layne’s back in his college days. When a DFW Native, Aggie alumni, and former MVP organically recommends a business/food–you’re sold. Von Miller is a legend in DFW.